It was a personal tragedy that brought Paul, 39, to Drewberry looking for insurance to protect his income. Paul very sadly lost Jeanette, his partner of 21 years, in July 2016, leaving him a single father to their 10 year-old daughter, Heather. Jeanette was only 45 when she passed away, which put things sharply into perspective for Paul. 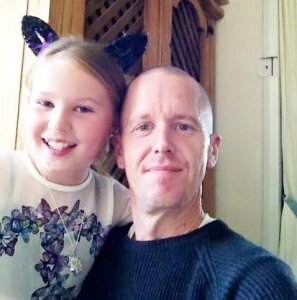 “The whole process of dealing with the legalities and finances following the loss of Jeanette made me realise that none of us are invincible, which so many self employed people seem to think they are!” he says. Paul’s been a self-employed sole trader for close to four years. Before striking out on his own, he worked for the Ministry of Defence. 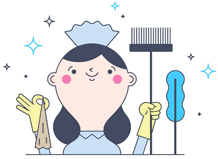 He was the operations manager for the East region of the country on all the cleaning services for service personnel accommodation. 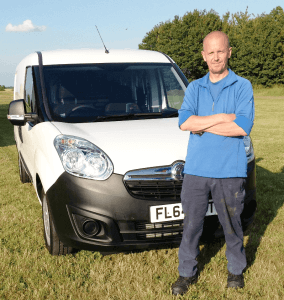 Paul left the MoD at the end of 2012 and his company, the small but hugely successful Clean Bedford Oven Cleaning, was born at the beginning of 2013. He now cleans around 1,000 ovens a year and is crammed with bookings until well after Christmas. Being so busy is partly why Paul appreciated the ease and speed with which Drewberry dealt with his enquiry and then arranged his policy. “I started searching and found Drewberry. In one phone call and a couple of emails, I had my cover arranged in a friendly and professional manner,” Paul says. Meena has considerable experience matching manual workers like Paul with Income Protection providers. After reviewing Paul’s situation, Meena used this to recommend a self employed sickness insurance policy with a well-known mutual insurer. “Being a manual worker, Paul would have attracted higher premiums on a guaranteed premium basis. Meena also chose this insurer because Paul is a smoker, which can attract a 40% premium hike with some insurers. By contrast, Paul’s new insurer is ‘smoker neutral’ and so doesn’t charge smokers additional premiums. As Drewberry is a whole of market intermediary, Meena examined polices across the entire marketplace before making his recommendation. Unlike some advisers, Drewberry charges its clients no more than they would pay if they went to an insurer directly. This means that we’re always competitive on costs, something that didn’t go unnoticed by Paul. “The cover Meena arranged stood head and shoulders above some others I looked at in price, waiting period and claim length,” Paul said. Having an Income Protection policy has allowed Paul to relax a lot more. His situation will be familiar to any self-employed person – he had no employer sick pay while state benefits would be far too low to meet his outgoings. With Income Protection in place, Paul no longer needs to worry about what the future might hold. This gives him more time to focus on the important things in life: spending time with his daughter. 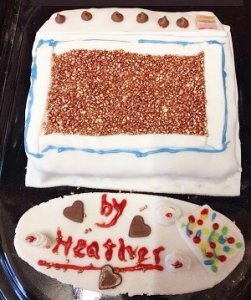 She also has a talent with ovens, although her skills are more in the baking line – and possibly in promotions judging by one of her most recent creations! “I am very pleased and feel much more equipped for the future knowing that I would survive if the worst ever happened,” Paul said. Since Jeanette passed away, Paul and Heather have embarked on a whirlwind of father-daughter activities. Crazy golf has been a particular favourite and they’ve even dabbled in a spot of archery. Having lost someone so close to them, they’re more aware than ever that they need to make every moment count.